In the mountain environmental category there were 1200 entries from 51 countries. 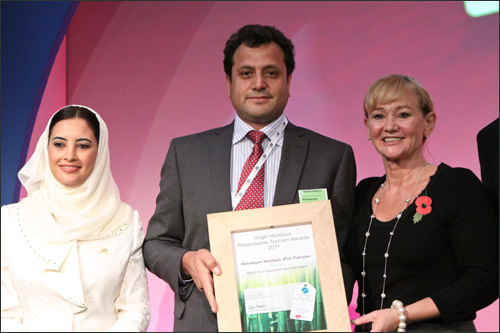 Himalayan Holidays Pakistan has won the World Responsible Tourism Award 2011. Every year at World Travel Market London, Virgin Holidays responsible tourism Awards take place, the process is year long the judges are the top brace of World tourism professionals around the world this award goes to the individuals and organizations based on their commitment to environment, wildlife, cultural and moral, ethical activities and benefit to uplift the communities they work.